You’ve probably been here: Teacher says “open-note” test and you rejoice in anticipation of an easy grade. Until you open your notebook and see … no notes, or really bad ones. Taking notes is an essential skill – not only for nailing open-note tests, but for processing information you’ll later need for class, essays and final exams. Knowing how to take good notes is so, so important, no matter what type of learner you are (visual or auditory), what type of class you’re taking (lecture or interactive), or how you prefer to take notes (paper, tablet, or both). The strategies below should help you refine your note-taking habits so you’ll nail that open-notebook test, and every single one after that. 1. Figure out your note-taking style. Do you like paper and pen? Tablet or iPad? It doesn’t really matter the tool you use to take the notes, as long as it works for you. Some students like the idea of using tech, but then get so overwhelmed with the mechanics of it (how to heck to use it) that they end up with sloppy or incomplete notes. Some students prefer taking notes on paper during class, but then get overwhelmed with how to organize the bazillions of papers they end up with. Figuring out what works for you may take some time, but I’d recommend trying both ways before you settle on one. And you might even end up using both methods, depending on the class and other factors. For example, you might use tech for an English or history lecture, but paper and pen for a science class where your notes might include diagrams and pictures. If you prefer to take notes on your tablet or iPad, there are some excellent note-taking apps out there, many of them free. (Check out Notability, Paper and Note Taker.) Some only allow you to input text, but most let you draw diagrams and other free-form objects. With some apps, you can even “write” your notes with your finger or a stylus instead of using the keyboard. 2. Capture the information. Once you’ve chosen your tool, you need to capture what your teacher is teaching you, as he or she is teaching it. This can be tricky, as some teachers talk so fast, without pausing to ask class questions, that you have a hard time listening and writing notes simultaneously. In fact, this was one of my biggest problems in college too: I once had a college chemistry teacher who spoke with such a thick accent that it took all I had just to figure out her words, let alone her lesson, let alone take decent notes. Not a good class for me! (And it didn’t help that I was emotionally allergic to the sciences, either.) But assuming that your teacher speaks your native language, and assuming that he or she isn’t talking a mile-a-minute, capturing the lesson in your notebook or tablet should be fairly simple. Not easy, but simple. a) Date and title your notes. Sounds obvious but it’s important. Don’t title notes from Monday’s biology class “Biology,” because that tells you nothing about what the lesson is. Instead, be as specific as possible. Try something like “Reproductive organs in flowers” or “How genes mutate” or whatever your teacher tells you the class is going to be about. If he or she doesn’t state in the beginning of class what the lesson is, then ask! b) Create your own symbols and abbreviations for words or concepts that your teacher keeps repeating. For example, if you need to write the word “heterogeneous” more than a few times, use an abbreviation such as “HeteroG” or “HetG” instead of spelling out the whole word. Doing this saves so much time! Start with the largest idea. Let’s say the whole lesson is going to be about reproductive organs in flowers. That would be your main title. 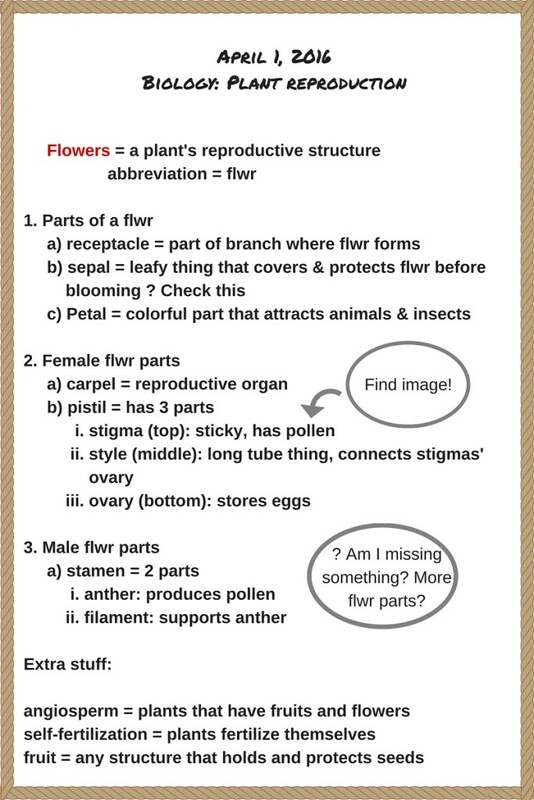 But under that, your first subtitle might be “Reproductive organs of female flowers.” Under that, using bullets, write down all the smaller details about female flower parts – perhaps what they are, how many there are, etc. Once your teacher begins talking about the reproductive organs of male flowers, you create a new subtitle, because you’ve now moved onto a slightly different subject. Keep going in this manner, creating new titles and subtitles as the topic narrows or changes. Tip: When in doubt, and you can’t figure out whether to continue with one subtitle or create a new subtitle, go ahead and create a new subtitle. It’s better to have too many than too few. During the capturing phase, you might occasionally miss what your teacher says, either because you didn’t hear it or didn’t understand it. If you didn’t understand something, or didn’t hear it, just raise your hand and ask him or her to explain or repeat the point. If that’s not possible, put a question mark (?) in your notes to indicate that information is missing. You’ll come back to this in the next step, step 3. Leave enough space between bulleted lists, in case you need to add more items later. Example of notes -taken during class- in bullet form. d) If you really struggle with note-taking during class, you could always record the lecture using a voice memo app or something similar. (Most teachers should be fine with you doing this – of not, then explain your situation to them, or, um, hide your phone!) You can start and stop the recording whenever you need to – no need to record every minute of the class. Getting an audio recording of the lesson frees up your mind to actually listen to what the teacher is saying, instead of scramble to keep up with note-taking. However, if you’re easily distracted, you could find yourself getting even more distracted with this method, as you might falsely think you can zone out and just listen to the recording later. If that sounds like you, then try taking notes and recording your teacher, thinking of the recording as a backup in case you miss something. 3. Review your notes and fill in the gaps. This is such an awesomely important step. I have advised so many students to try this method, and every single one has said it has worked wonders. Try it! No, like, really try it. Referring to the image above, you would type out flwr to flower. You would research to see if there are any more male flower parts you missed during class. Google an image of the flower parts to better visualize the material. Put all definitions in one particular color. Etc. If you use pen and paper to collect your notes, try typing up your notes at this point, or at least rewriting them to make them cleaner and more organized. (Paper can get messy when you’re editing, erasing, and rewriting things.) If you used tech to take your class notes, then you don’t have to retype them entirely, but definitely clean them up, edit, and re-read what your wrote. There are multiple benefits to taking this extra step. The first benefit is obvious: you’ll have neater notes. The second benefit is that by rewriting your notes, you’re actually studying, processing, and learning them. Learning happens when we repeatedly revisit information — that’s like a scientific fact. So by typing up your notes, you’re already one step closer to committing the information to memory. If you exclusively used an audio recorder to capture your notes, then now would be the time to transcribe everything to paper. Play the recording while writing or typing up (only) the important material from the recording. If you just used the recording method as a backup, but still took notes during class, then use the recording to “fill in the gaps” on any parts you missed. 4. Organize and store your notes. If you use a spiral bound notebook to take notes during class, typing them up in step 3 means you’ll be using loose-leaf paper. So logically, you need a place to store your revised, clean notes. I’d recommend a 3-ring notebook for each class (if you take a ton of notes) or one larger 3-ring notebook where you could store your notes for all your classes, separated by tab dividers. Using a 3-ring binder allows you to reorder your notes, remove notes to make photocopies (you could totally charge your friends $2 a page), and add in relevant class handouts and worksheets. 5. Study! When it’s time for your test, you’ll be amazed at how much easier the studying process will be. You’ll know exactly what to study, you’ll know where all the information is, and you’ll actually be able to read it. Of course, you still have to put in the hours of studying the information (learn how to study anything, here), but you won’t have to waste any time finding what you’re looking for. And you might even get to shave a little bit off your study time, because you’ll have started the “learning” process back when you typed or rewrote your notes back in step 3. I hope my strategies for how to take notes help you to feel more organized and more in control of your note-taking system. 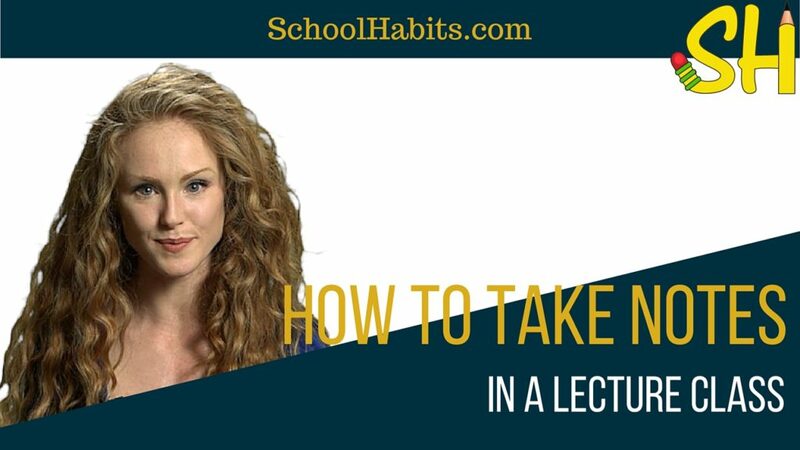 It’s never too late or too early to improve your school habits, so whether you’re in seventh grade or college, you can benefit from following my five steps to better notes. And honestly, if there is anything I can explain more, or if you have any questions at all, let me know!